Your Community Center is near! Oct. 21- Canal Fest in Walnutport - NLCC will be selling homemade Mac & Cheese! between Washington Township , Walnutport Borough and Slatington Borough to improve and enhance all shared community park and recreation resources. 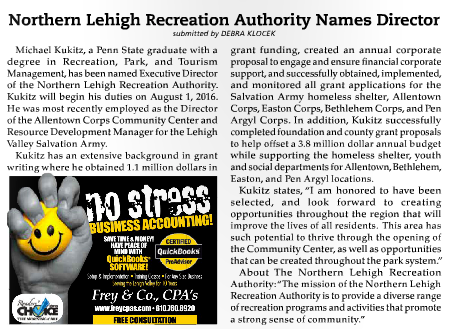 This new municipal arm, the NLRA will also oversee the completion of the Northern Lehigh Community Center. The NLRA looks forward to working with the existing volunteer groups in the community as well as adding programs, events and opportunities throughout Northern Lehigh's expansive park system for all area residents to enjoy. Meetings are held at Slatington Borough hall the 3rd Wednesday at 6:30pm. All are welcome! the following Community Needs Assessment. Please complete the survey and let your voice be heard.It only takes three minutes to complete!